The Wob Dwiyet is a style of ladies' dress which began appearing in the French West Indies towards the end of the 18th century. Its design is believed to have originated from Southern France, where women at the time wore a similar outfit. Today, this traditional style has long since gone out of fashion. 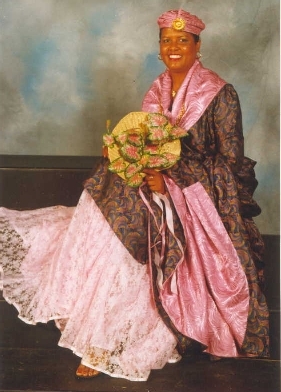 In Saint Lucia, as with several other former French colonies, the dress is considered a significant aspect of the country's colonial heritage and as such, is the design on which its National Costume is based. A long petticoat made of cotton or satin and decorated with rows of lace and ribbon. The Dwiyet - A full-length outer dress with a trail and narrow sleeves that extend to the wrists. A Foulard - A scarf worn around the neck and shoulders with a triangular apex at the centre of the back and attached to the Dwiyet at the front with a brooch. This scarf is made of satin and is usually of a colour that contrasts with that of the dress. The Tete Casé - A folded head piece which is decorated to suit the taste of the wearer. In addition, wearers of the Wob Dwiyet adorn themselves with a substantial amount of jewellery including long necklaces and large earrings.